First, we will create a new folder in our project, called “Ribbon”. Right-click the folder, select Add > New Item, and pick Ribbon (Visual Designer) from the available templates. 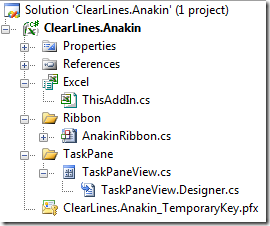 We will call our ribbon “AnakinRibbon”. First, we will add a new Tab to our Ribbon. Expanding the Office Ribbon Controls section in the Toolbox reveals the set of controls we can use, most of them familiar. 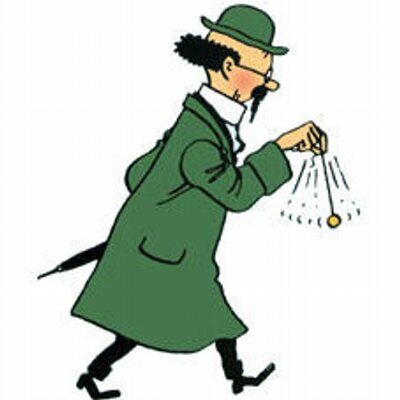 Grab the Tab control, and drag it over the Ribbon (or right-click the Ribbon, and select Add Ribbon Tab). A new tab shows up, which is not marked as built-in. If you hit F5 at that point, you will see two things: the Add-Ins tab now contains an empty group (the group that is created by default), and a new tab has been created for us, where we could add controls if we wanted to use a custom tab. First let’s hook up the new tab, so that its contents show up in the Review tab, instead of inside a new one. To do this, we need to provide the Tab with the Id of the built-in Excel tab it will be hosted in. 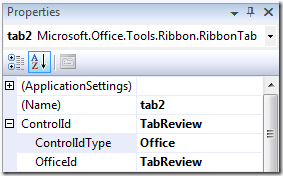 Select the tab, and in the Properties window, modify the ControlIdType from “Custom” to “Office”, to indicate you want to use a built-in office tab, and type in “TabReview” in the OfficeId field. 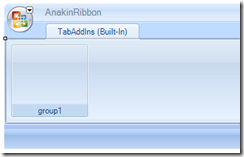 Next, let’s create a Group for our add-in, change its Label to Anakin, and drag a Button to the group, which we will label “Compare”. Hit F5 to debut the project, you should see something like this, with the Review tab now containing our group and button. The Globals class exposes an internal static property ThisAddin, which provides access to the Add-In from anywhere within the add-in solution. We use it to navigate to the TaskPane, and make it visible whenever the button is clicked. The last thing we have to do is to remove the default add-in tab and its group from the ribbon. 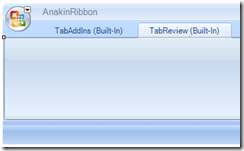 Open the AnakinRibbon designer, right-click on the AddInTab area, and delete – and we are done. Now that our hooks are in place, we can begin to add some real functionality to our add-in. In the next installment, we will work on adding a tree view to the Custom Task Pane, so that the user can select which of the currently open worksheets he/she wants to run a comparison against. We will use WPF for that control – because the WPF tree view control is great, and because the ability to use WPF in Office Applications is a fantastic feature!